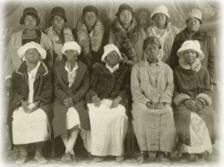 For more than three centuries, African American midwives delivered babies and practiced basic family medicine mainly in rural counties in the South. The role of those midwives, and the contributions they made to maternal and infant care, are highlighted in a new National Library of Medicine exhibit that opened in February. Nothing To Work With But Cleanliness: African American “Grannies”, Midwives & Health Reform uses photographs and artifacts to celebrate the compelling story of “granny” midwives, who delivered babies and brought basic medicine to generations of rural Southerners. Midwifery came under public scrutiny in the 1910s when progressive reformers blamed the “unsanitary practices” of midwives for the higher rate of maternal and infant deaths. During the next two decades reformers campaigned unsuccessfully to eliminate the practice of midwifery. There simply were not enough skilled physicians or hospital facilities in southern rural communities. Poverty and pervasive racial discrimination also made home births more desirable than hospital deliveries to many of the African American families living in rural counties. 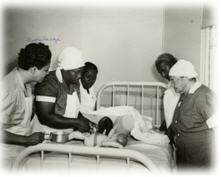 Training midwives was deemed the only viable solution in the South where African American midwives were predominate. Midwives received instruction from public health nurses during annual state-sponsored institutes and monthly local midwives clubs. Classes, which emphasized sanitary delivery practices, were taught by demonstration, songs and role playing. From the 1920s through the 1960s this next generation of midwives continued in the tradition of their “granny” predecessors with the added benefit of scientific knowledge. The exhibit was curated by Sheena Morrison of the History of Medicine Division. The exhibit will be on display at the NLM History of Medicine Division Reading Room, Building 38, first floor, through June 2010. An online version is expected in the summer. Bottom photo, midwives demonstrating handwashing technique during an institute, St. Mary’s Parish, Franklin, circa 1940s. February 5, 2010 in Exhibitions.